Activists Thursday hailed the passing of a historic bill protecting women’s rights in Punjab, with the legislation establishing a helpline and shelters while calling for some defendants to wear GPS trackers. 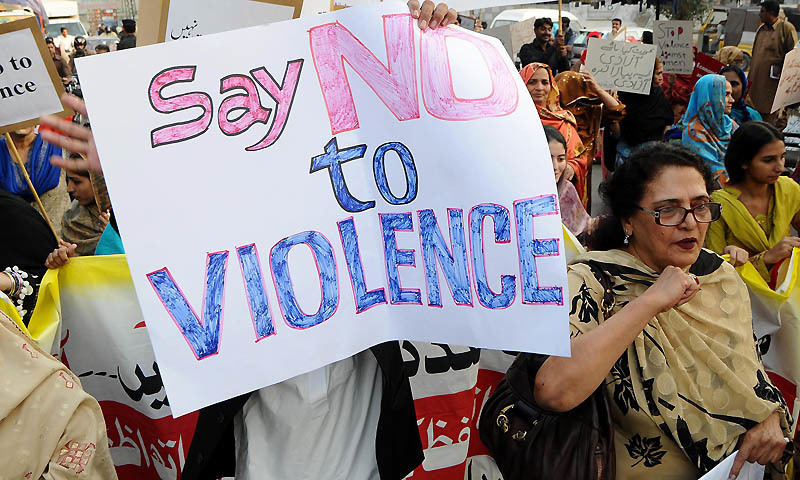 Punjab Protection of Women Against Violence Bill redefines “violence” to include “any offence committed against a woman including abetment of an offence, domestic violence, emotional, psychological and verbal abuse, economic abuse, stalking or a cyber crime”. Zohra Yusuf, head of the independent Human Rights Commission of Pakistan (HRCP), welcomed the bill and expressed the hope that efficient enforcement will help protect women and ensure that offenders do not escape justice. “The bill appears to be a rather comprehensive attempt to institute a system for prevention of violence against women and for protection and rehabilitation of the women victims,” Yusuf said in a statement issued Thursday. Yusuf said the bill includes a broad definition of violence and steps to make complaint submissions easier. “These are all much-needed measures that deserve praise but it is important to remember that cosmetic and purely procedural changes have not had an impact in the past,” she said. Abdul Qahar Rashid, spokesman for Punjab’s provincial assembly, told AFP that the bill, which was passed unanimously, must be signed by the provincial governor before it becomes law. Under the new legislation, the government will institute a universal toll free help line for the women, and will establish district protection centers and residential shelters under a phased programme. Family courts must fix hearings within seven days of a complaint, the bill says, with all complaints to be decided within 90 days. The court can also order a GPS tracker to be installed to monitor a defendant’s movements, provided an act of grave violence has been committed or is deemed likely to be committed. Women in Pakistan have fought for their rights for decades, in a country where so-called honour killings and acid attacks remain commonplace. While lauding the Punjab government for passing the ‘Protection of Women Against Violence Act 2015’ as a good first step in addressing ‘the oft ignored elephant in the room’, Digital Rights Foundation (DRF) also shed some light on the some problems with bill ‘that need weeding’. The bill mentions several forms of violence, and includes stalking and other cybercrimes but fails to provide clear indications and explanations of what those terms mean and entail; in comparison, the newly added terms “economic abuse” and “psychological violence” are further elaborated upon in greater length. It is regrettable that what constitutes as cybercrime is not clearly explained in more detail, especially in the context of cybercrime-related cases that are constantly on the rise. Cyberstalking, harassment through social media, sharing of inappropriate (and usually stolen) material, unauthorised power and access of computer systems, and the distribution of personal information belonging to other people all constitute cybercrimes; it is important that the legislation mentions this salient point, so that laypeople, women in particular, can easily understand what manner of acts can be reported, and what the penalties are. Complicating the matter is the fact that many cybercrime offenders – including in particular online bullying and cyberstalking – will create numerous fake social media profiles. In doing so, quickly ascertaining who is actually behind the profile, and is the guilty party sought after, before they are aware of police being on their scene, becomes more difficult. There is also the question of what the repercussions maybe for a wife that reports her husband and leads to him being tracked with a wrist GPS. There is the potential danger that a man may react even more violently to the social ridicule and ostracization that may come with it. Moreover, there are no provisions to indicate who will be monitoring on the GPS trackers. We also do not know whether Pakistan even has the mechanism or capacity to handle such a medium of monitoring someone. Who will prevent this provision from being abused and how? Will the police, which is already lacking in resources, be able to react in time to a man violating the GPS order and staying away from his victim? There are many questions that need to be posed about these trackers, and the answers are nowhere in sight. The blog further says that the the weaknesses in this Act could pose major problems in the future, adding that in it’s current state, it is a fabulous work in progress that requires improvements.